I'm not entirely sure how to introduce the Talents LP Vol. 1. 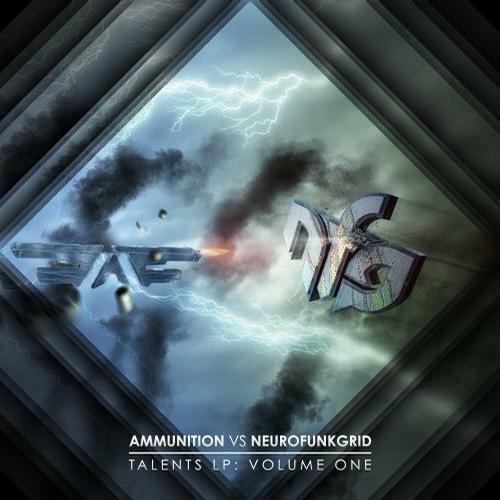 On a factual level, it's true the compilation is made up of 10 neurofunk drum & bass tracks from up-and-coming neurofunk producers, presented jointly by major neurofunk label Ammunition Recordings and major neurofunk YouTube promotion channel NeurofunkGrid. And, to be fair, I could just leave it at that, but that doesn't encompass the whole scope of a fantastic neurofunk compilation such as this one - it's more than just another 10 tracks of techy, spastic drums and the same damn modulated synth line every time. On a more opinionated front, I could also say it's one of the best releases in the genre in a while. Which is true - sure, none of the producers quite have the skill or experience of the absolute legends like Noisia or Ed Rush & Optical, but all ten tracks here are quite impressive. They're at least forward thinking, not falling into over-trodden territory like a lot of recent neurofunk has. But I think the best way to describe the compilation is this: Talents LP Vol. 1 is a release which should give people hope for the future of neurofunk. It shows both that the genre thankfully won't be staying in the same place for too long and there is indeed some excellent proverbial fresh blood in the water. The most notable example of the compilation's achievement is standout track "Tangent Line" by Object. It's got some seriously powerful toms to lead the listener right into the main section, incredibly disorienting and fun in its own right with its thudding, shocking bass and off-center beat. Christ's "Hidden Depth" is another great example of what some people would call an "absolute tune," with its excellent ticky neurofunk drums behind a heavily pulsing wall of synths. Really, though, this release should be a great launching point for all ten producers' careers. There's not a bad track here, and the compilation as a whole is a testament to the success of both NeurofunkGrid and Ammunition Recordings. If anyone finds neurofunk at all interesting, this release is a must-have. You can buy the compilation on Beatport here.